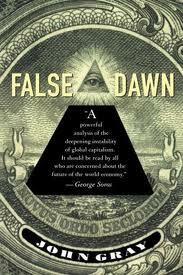 A FALSE DAWN FOR FREE MARKETS- LAISSEZ-FAIRE? John Gray is among Britain’s ” former ” conservative thinkers who had major influence on Margaret Thatcher during her tenure as British Prime Minister. Gray, a long-standing unfettered free enterprise advocate , had an epiphany regarding his economic views and in 1998 published False Dawn, a highly academic discussion and prediction as to why a laissez-faire global economic system was unworkable and forecast the economic calamity that fell upon the U.S. and the world in 2008. Gray’s thesis in False Dawn is that the American-style unregulated free market system was the major contributor leading up to the world economic implosion of 2008! False Dawn is a heavy reading assignment! However, the perspective Gray brings to the discussion of government’s role in the free enterprise system is both provocative and startling. Of particular note is his reasoned analysis of why he now conversely believes that only government involvement in the framework of free-enterprise can prevent the income disparity that exists in both the U.S. and international economic system. Gray makes the case that income disparity, now seen in largely un-regulated world-wide free-enterprise economies, has led to economic perdition. He warns of the danger of the IMF for trying to impose the US economic model on the world. So what is the take-away? Has Gray gone from a Thatcher conservative to socialist? I think not, but he is a strong advocate for the necessity of some government role in fostering growth and regulating free enterprise. The growth side of the Gray proposition comes from his advocacy of government investment in infrastructure, scientific research and new technologies, all of which is part of the contemporary economic and political dialogue! Ironically, as I was finishing False Dawn the January 12, 2012 issue of The Economist arrived with a cover story The Great Innovation Debate. While the article does not focus upon income disparity, it makes a strong case for government spending on infrastructure and basic research. As might be expected, the government investment advocacy does not come without The Economist warning of too much regulation “getting in the way of the 21st century’s innovative juices.” Many sides to a complex issue. False Dawn is a great companion read to those fans of Tom Friedman, in particular Hot-Flat and Crowded and Robert Wright’s Non Zero. In all three cases you may wish to take notes!